Cardamom or Elettaria Cardamomum Maton is called as the Queen of Spices. It is a very costly spice and is seen in the high ranges. Cardamom is produced mainly on shady slopes of the Western Ghats. It is the dried fruit of a perennial herb. It has a very long history background which is as old as the human civilization. The factors required for cultivating high quality cardamom in Kerala are warm and damp climate, soil having organic matter, distributed rainfall, unique cultivation and processing methods. All these help to produce cardamom which are unique in their size, color, aroma and flavor. The cardamoms are in great demand in the International market and they are available in various types and grades. Some of them which are widely used worldwide are ‘Alleppey Green Extra Bold’, ‘Alleppey Green Bold’ and ‘Alleppey Green Superior’. Cardamom oil is also in great demand and is used as an ingredient in food, perfumery, medicines and beverages. Cardamom is said to be exported to Arab countries on a large scale. In those countries it is used mainly for the preparation of a cardamom-coffee mixture called as ‘Gahwa’. It is one of the most important beverage that is offered by the arabs to their guests. 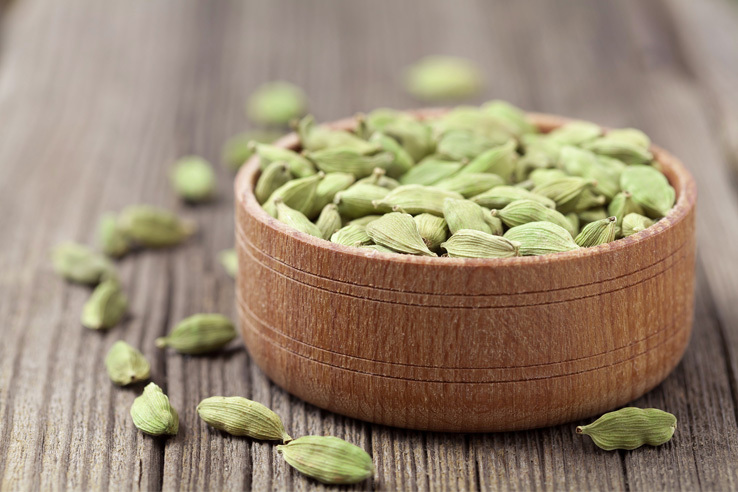 The people from Middle East, Japan and Russia always prefer Indian cardamom because of its varied properties. The cardamom oil is used to prepare medicines. It can be used simply for chewing. In medicine, they are useful as powerful aromatic, stimulant, diuretic and is not used alone. It is good for stopping nausea and vomiting and helps to combat digestive disorders. It is also suggested to use cardamom for freshening your breath and helps in smooth digestion.